Tired of the lies and bitter chitter chatter Paula J. Moore (pictured seated), known in many circles as The Harlem Matriarch, has decided to finally set the record straight on statements being made about her client Charly Wingate, better known as Harlem rapper Max B. In an exclusive interview with Hip Hop Ruckus, Moore addresses the false notion that Jim Jones bailed Biggaveli out of Bergen County Jail on murder charges in July 2007. 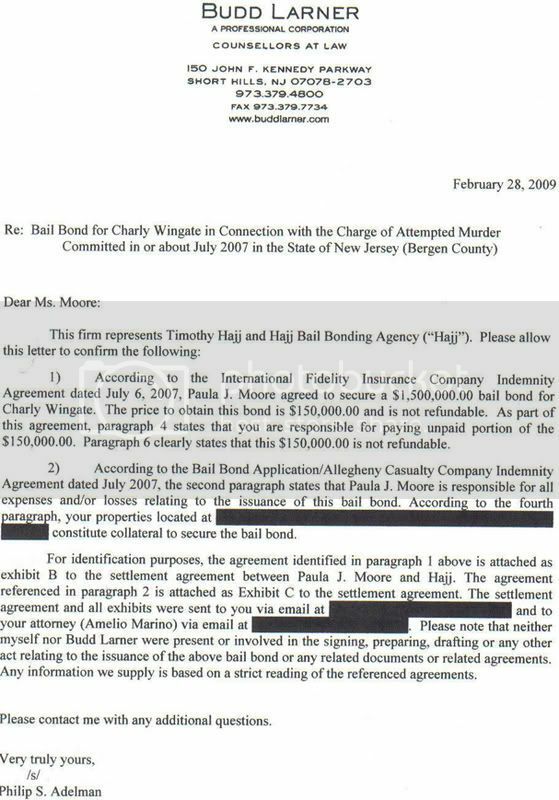 Although Max B and his lawyer Gerald Saluti both recently thanked Jones for posting the rapper’s bail on a video that circulated the Internet in January, Moore has provided HHR with a legal document (see below) clearly confirming that she, and not Jones, “agreed to secure a $150,000 bail bond for Charly Wingate.” Even though the document was redacted to conceal Moore’s address, the document makes light of “properties” that she put up as collateral to secure the bail bond. “Jim Jones was not interested in helping Max B get released out of jail until he heard that someone was bailing him out. Unbeknown to me, Jim Jones found out that I was going to be bailing Max B out and he went to the jail and convinced Max to sign all his publishing over and loaned him $90,000,” says Moore, about the events leading to Max B’s release from prison. It is well known that the two rappers have been feuding since Max B accused Jones of not breaking bread for several hits including the smash hit “We Fly High.” Max B is currently signed to a three-album deal with Amalgam Digital. “A king can only be as powerful as his army. Mel Matrix, Freaky Zeekey, Hell Rell and the whole Byrd Gang put together is not as talented as Max B by himself,” Moore proclaimed. She promises to unravel more tales of lies and deceit in her upcoming DVD “The H.O.T. DVD” (Harlem On Top) featuring her client’s co-defendant Kevin ‘Poo Simms’ Leerdam, who Moore says was secretly taped live from the Bergen County Jail admitting to lying and misleading Dipset members about Max B snitching on him as it related to their pending murder trial. Moreover, Moore said she has proof that, "...Jones continues to steal music without paying any acknowledgement." According to the Harlem Matriarch, she says Jones’ new single “Na Na Nana Na Na” was stolen from an unnamed 16-year-old artist who presented the song to the Diplomat CEO on a demo two years ago. Click to view Max B’s Bail Bond.